Everything ached when I woke up at about 08.00. I think the last few days of Devon and Cornwall hills had finally caught up with me. My legs were stiff for the first time in ages, and my forearms and hands ached from all the hill climbs. A warm shower helped alleviate the muscle fatigue, followed up with breakfast at the campsite cafe. Over a fry up I worked out I still needed to cover about 70 miles a day to get to Latitude on time, but could afford a slower recovery day today. I think I needed it physically as well as mentally, having somewhat run out of steam. After packing up I was on the road by 10.30, cycling down to Land’s End via Sennen and passing the First and Last Inn on the way. I pedalled into the Land’s End visitor centre, which is slightly on the tacky side with attractions such as King Arthur’s quest. The coastline however is fantastic affording superb views out over the Atlantic. Consequently I took rather a large number of photos which I’ve put into a gallery. I even managed to get the horizon straight on some of these, will wonders never cease. I met another cyclist whilst at the famous sign-post, which was massively crowded with people wanting to get their photo taken. He was visiting Land’s End by car today, and took my photo for me next to the sign. He lives in Exeter and is recovering from kidney cancer – yet another person affected by this disease. It was nice to have a chat and good to hear he still gets out on his bike, doing some big distances albeit not as quickly as he used to due to reduced lung capacity. Good on you! I spent about an hour at Land’s End enjoying the perfect weather, and despite it only being the morning had a beer to celebrate completing a Jogle, albeit a very long winded version thereof. After having a walk around a bit of the coastal path I got back on my bike, ready to tackle the South Coast of Britain. It felt like I’d reached another milestone on the tour, and that I was really getting into the last stages of my ride. Unfortunately the wind had changed direction to a North Easterly, which was a little frustrating considering I’d been looking forward to a prevailing South Westerly. Fingers crossed it would change again soon. I hit the hills once more, pedalling past Porthgwarra and Porthcurno, both sites of childhood escapades. 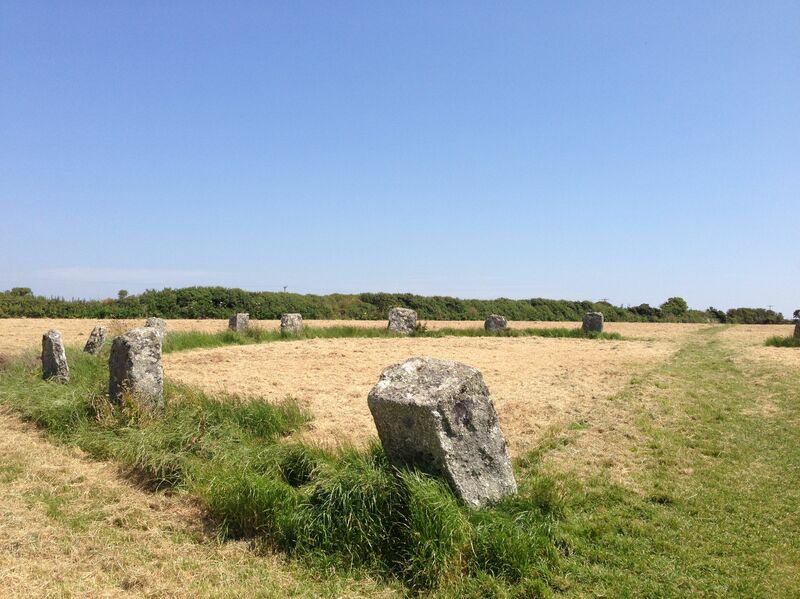 I stopped at the Merry Maidens, a late Neolithic stone circle, for a quick break. I’d driven past the circle many times, but can’t remember ever actually having visited it properly, so took a wander up. The circle has other standing stones called the Pipers associated with it, and legend has it that the Maidens and Pipers were turned to stone for dancing on the Sabbath. This is a little odd as I’m pretty sure they didn’t have the Sabbath in Neolithic times, Christianity not having arrived in Britain until a lot later. This tale is not uncommon, apparently being associated with other stone circles, and is probably adapted from earlier tales not involving Christianity. Whatever the truth the circle is a nice relaxing spot, and it was nice sitting in the grass listening to the ever present skylarks after the busy road from Land’s End. It was quite bizarre touching the sun warmed stones and thinking they were erected thousands of years ago. I wondered what the people were like who lived here at the time, and what they used the circle for. Perhaps it was a calender to mark the passing of the seasons, or a site to perform religious rituals, or maybe something more mundane like a UFO landing site, or stone age drive through. The stones will no doubt be year for thousands of years to come. 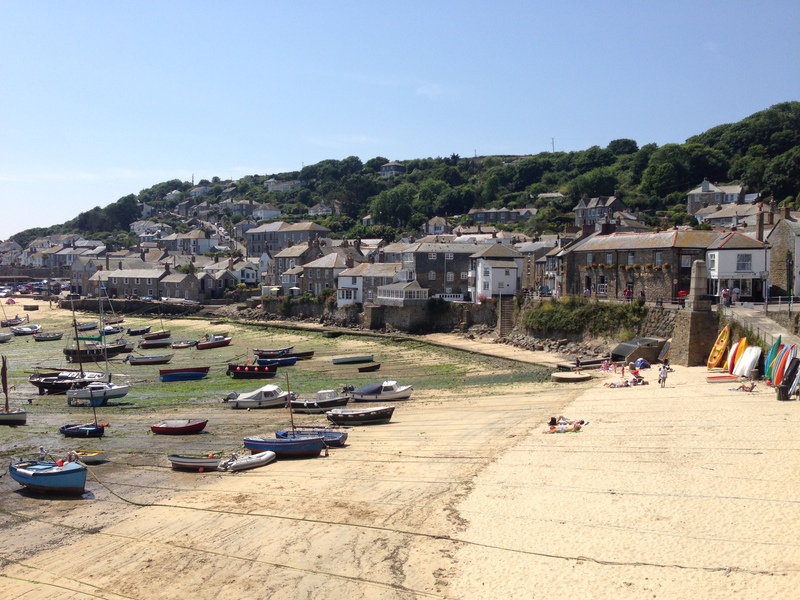 I pedalled on to Mousehole, scene of a childhood fishing misadventure, and stopped for another walk about. My brother and I were fishing off the end of one of the piers, many moons ago, when everything went slightly awry. I cast the line, which sailed out across the mouth of the harbour straight into the wooden beam on the other side. I reckon the wind must have taken it. The hook on the end of my line became thoroughly embedded in the wooden beam, and despite much cajoling would not come loose. Worse was to come in the form of a motor boat that wanted to get into the harbour, but was obstructed by my line. I should have just cut the line, but being very young panicked and tugged harder, which just resulted in embedding the hook further into the wood. More yanking resulted in a sickening crack as I broke my Dad’s wooden fishing rod, which he’d had since he was a child, and the end slipping down the fishing line. Calamity! Eventually a group of kids on the other side came to my rescue and unhooked the fishing line so I could reel it in. Not my greatest ever day’s fishing, however Dad was quite sympathetic. 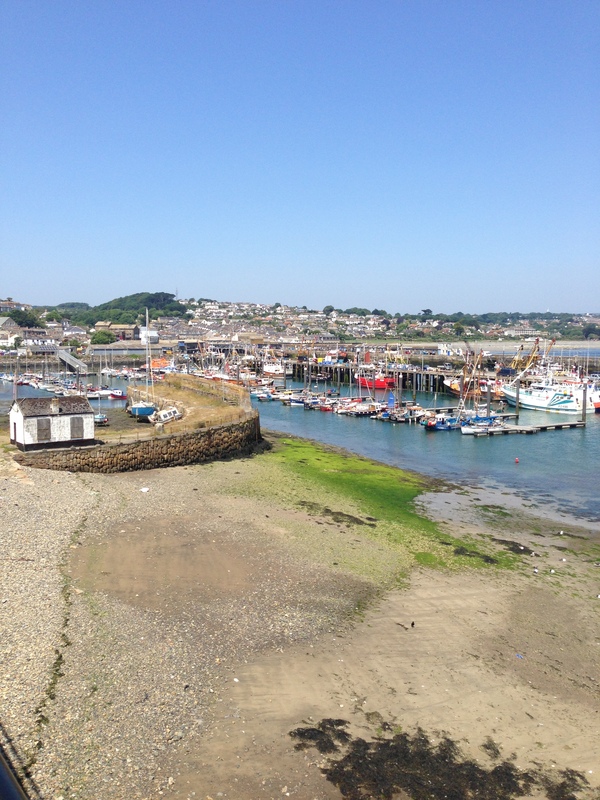 Despite the bad memories from that fateful day Mousehole is a lovely fishing village, and it was good to have a walk around the harbour, passing the Ship Inn where I’ve enjoyed scampi and chips several times. 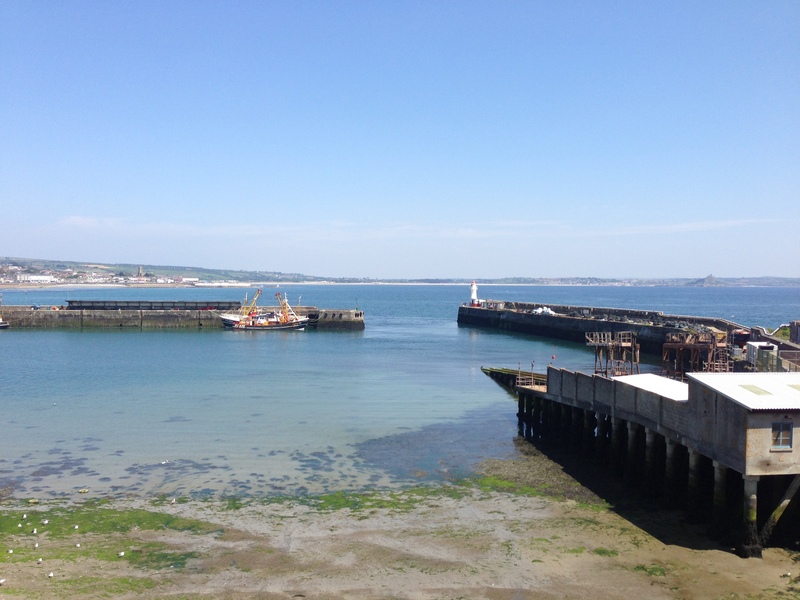 I continued on to Newlyn where we stayed whilst on holiday. We used to fish off the South Pier, but that’s closed to the public now due to health and safety I think. Health and safety rules are pretty vexing at times. There definitely aren’t as many fishing boats in Newlyn harbour as there used to be, which I guess is down to fishing quotas making it very difficult for fishermen to make a living. I agree that fishing needs to be controlled to allow stocks to recover, however it’s sad to see a decline in the traditional way of life for so many people around the coast. 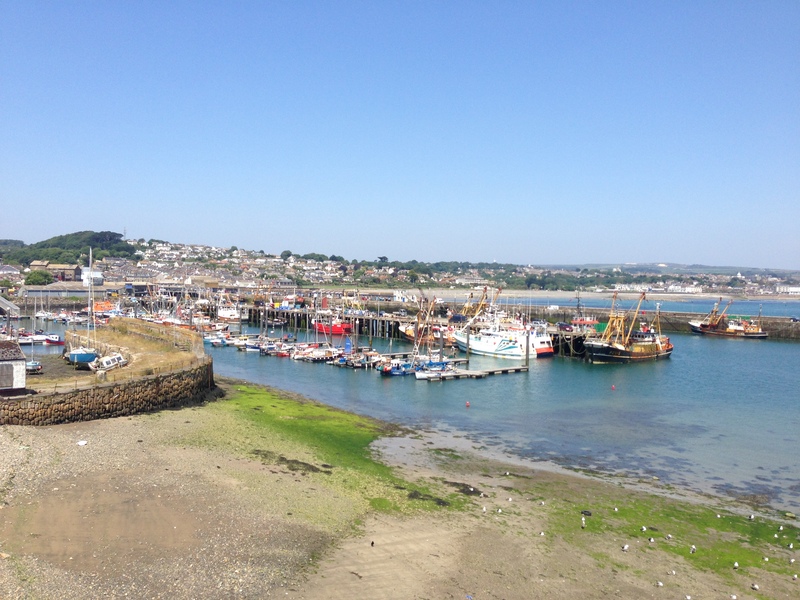 Despite the lack of fishing boats compared to yesteryears, Newlyn hasn’t changed a lot, and it was nice to stop and remember some fun times fishing out in all weathers, or walking down to the old harbour. 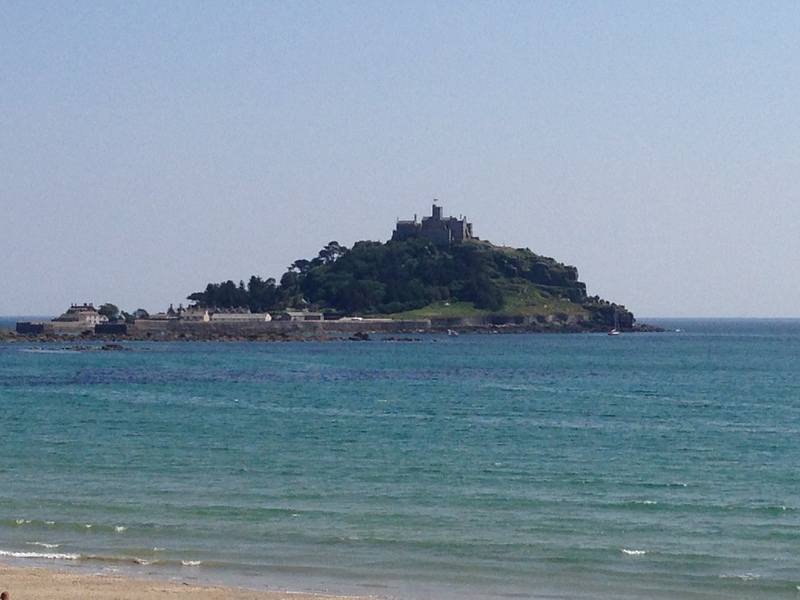 I rode on around to Penzance, where feeling a bit peckish I stopped for a baguette on the seafront. It really was a gorgeous day and really hot, however I was still feeling pretty tired so was glad to be taking it easy. 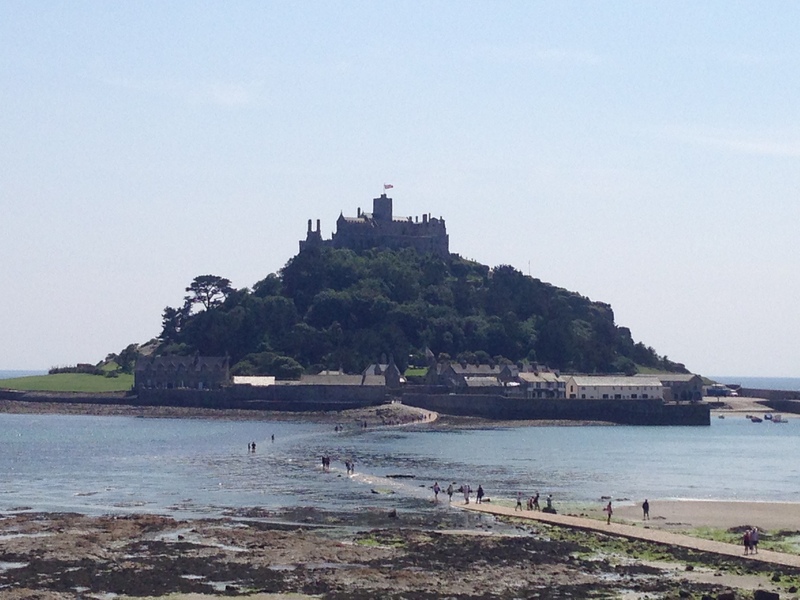 After lunch I pedalled on to Marazion, passing St. Michael’s Mount where people were paddling across the partially submerged causeway to the small tidal island. 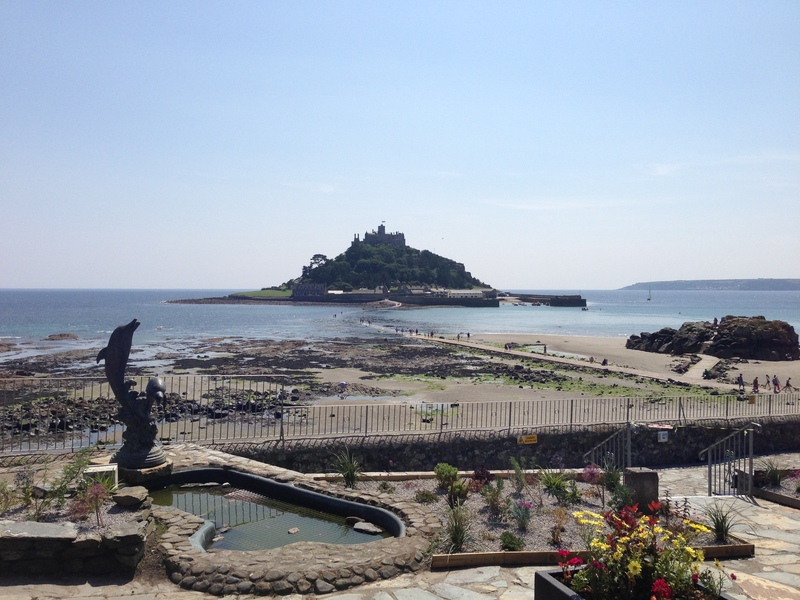 St. Michael’s Mount is called Karrek Loos yn Koos in Cornish, which means ‘grey rock in the woods’. The island was once surrounded by forest rather than the sea, but at some point the sea flooded in and cut it off from the mainland. There are varying accounts of when this may have taken place, and various interesting historical facts and legends associated with the island. Was it part of the fabled ancient kingdom of Lyonesse, or the island visited by the Greek geographer Pytheas in the 4th century BC? The Mount has been the site of a monastery in the past, and still boasts an impressive looking castle. From Marazion I cycled round to Helston on the main road, the A394, up and down several hills which were pretty challenging in the heat. The buzzards were circling waiting for exhausted cyclists to fall by the wayside and provide a tasty meal, although by this stage of the tour there was far less of a meal to me that when I’d started. I seen a lot of buzzards since entering the west country, along with a variety of other birds of prey. Drinking a lot of water and taking it easy in the hot weather I turned on to the A3083, passing Culdrose Airfield, and cruised down a comparatively flat road to the Lizard, the most southerly point on the UK mainland. The Lizard wasn’t as busy as Land’s End but there were still a lot of tourists about, and a decided lack of lizards which slightly confused and disappointed the Lobster who I think may have been suffering slightly from sunstroke. The name ‘Lizard’ may originate from the Cornish name for the area, which means ‘High Court’, so it may have been an important settlement in the past. Or it may be to do with the serpentine rocks which stretch down into the sea and look a bit lizard like. It’s a lovely spot, with Kynance Cove on the western side of it, and well worth a visit. The whole coast is worth a visit when the weather is good, or bad if you’re prepared for it; visually stunning and emotive in all seasons . When conditions are bad and the sea rough you can well imagine why it’s hazardous for shipping, the coastline around here being known as the ‘Graveyard of Ships’, hence the many lifeboat stations including one at the Lizard. 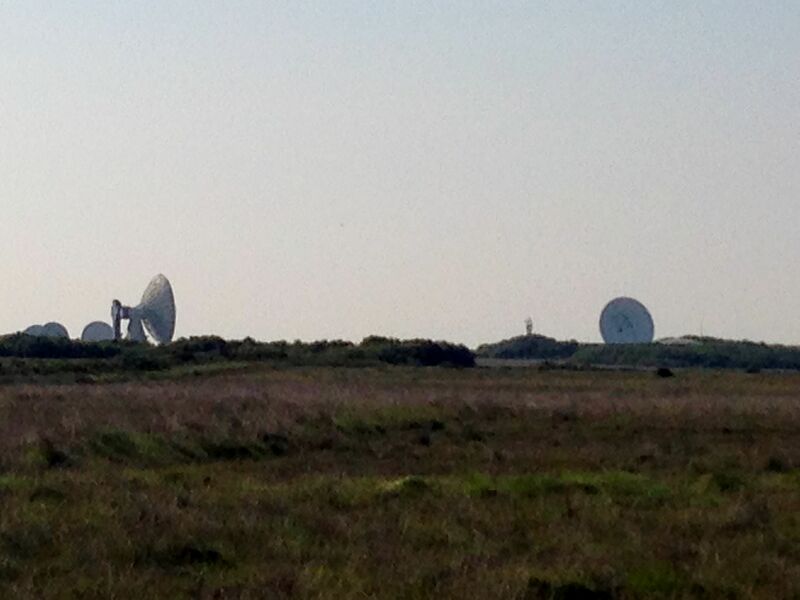 After a break I rode back up the road, before turning off to Goonhilly passing the ‘Satelite Earth Station’. 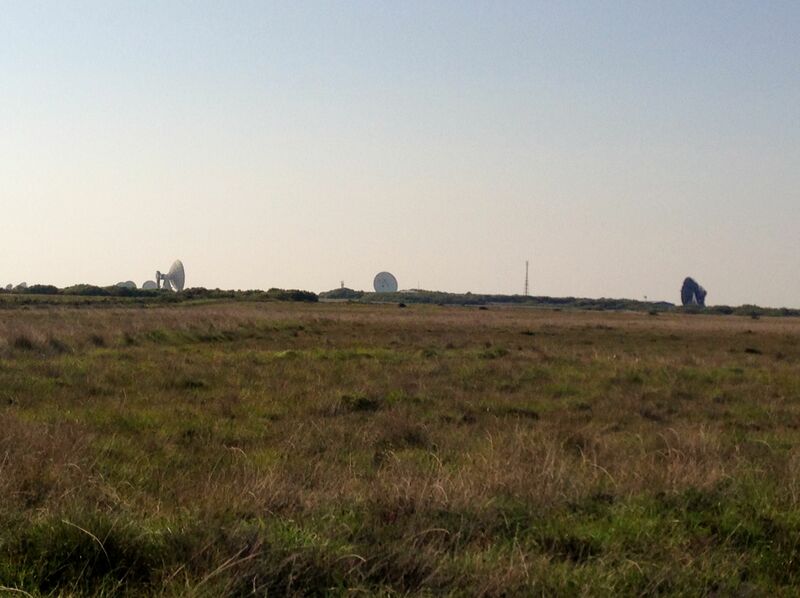 The satellite dishes looked like something out of Star Wars, and I half expected to see an Ewok pop out of the long grass. Maybe Lobster wasn’t the only one suffering from a bit of heatstroke. Chief Chirpa did not make an appearance as I pedalled past. Feeling tired I decided to stop early after covering just 51 miles, my shortest day in a while. 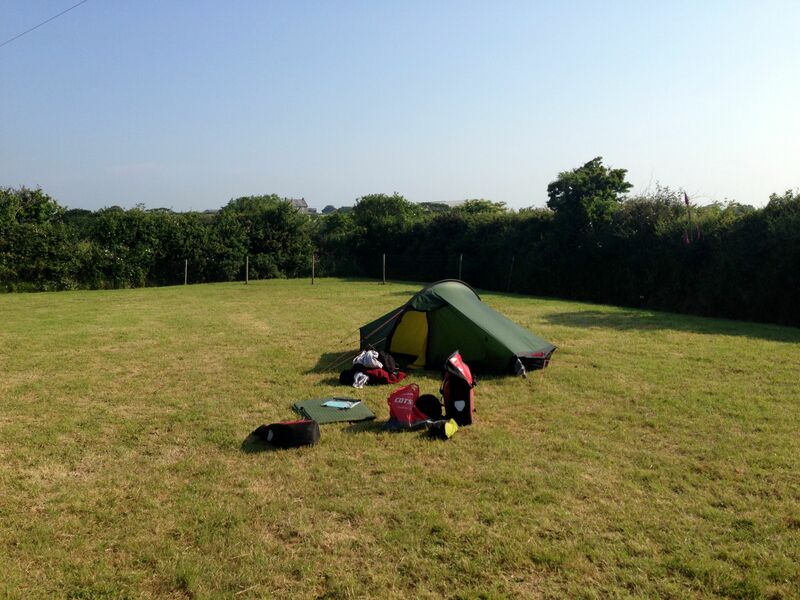 I found a campsite in Newtown-in-St.-Martin, not far from the Helford River which I planned to cross tomorrow. 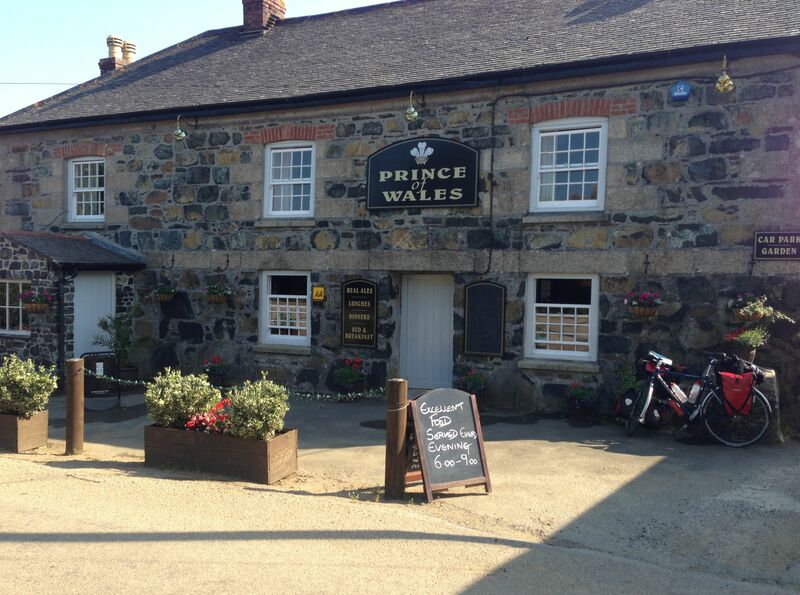 The campsite was a bit of a find, also being a pub – the Prince of Wales. I set up my tent and had a very welcome shower, before making my way to the pub to celebrate completing the full set of cardinal points; I’d been to the furthest points north, south, east and west on the UK mainland. As a morale booster I treated myself to a meal in the pub too, going the whole hog and ordering a starter, main course and dessert. 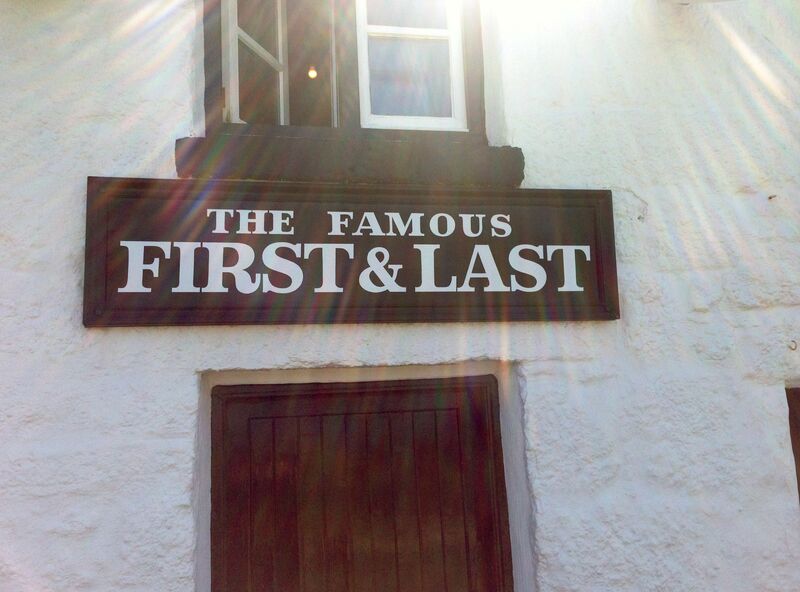 A spectacular home-made burger followed fish-cakes, with the meal rounded off by treacle tart and clotted cream. I’d really needed the early stop and thoroughly enjoyed my evening in the pub. I intended to be up in good time the following day to take a series of ferries along the coast, starting with the Helford River crossing, before cycling on to Falmouth and beyond. The weather forecast looked like it was going to be another hot one, so I had one more pint of Cornish Ale (Lance) to ensure I was properly hydrated before going to bed. I can also recommend the Rattler Cider. This entry was posted in Bike around Britain 2013 and tagged adventure, bicycle, bike, Bike around Britain, charity, countryside, cycle, cycle touring, cycling, expedition, fundraising, Land's End, outdoors, photos, rest day, sunshine, The Lizard on September 15, 2013 by SelfPropelled. Wonderful pics, you had great weather for your trip to the southwest. You’re right about the forest surrounding St Michael’s Mount at extreme low tide you can see the remains of the primevial forest poking up from the sea.